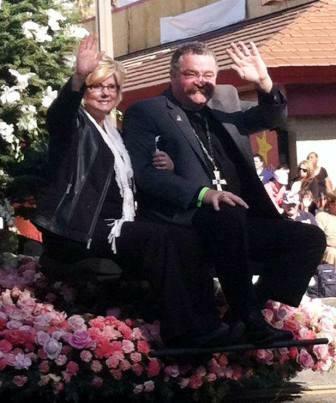 Our 64th Year of Witnessing the Gospel Message in the Rose Parade! 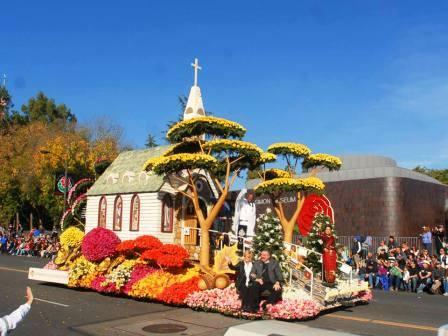 The Lutheran Hour Ministries float was the winner of the Princess Award for Most Beautiful float 35 feet and under in the 2014 Pasadena Tournament of Roses parade. Riders on the float included Rev. Dr. Matthew Harrison, president of the LCMS and Kathy, his wife, (pictured above) along with two Lutheran Hour Ministries International Directors. The beautifully flower-lined pathway leading to the open church doors were adorned by the flags of many nations welcoming all to Jesus. It was fitting that with this year's parade theme, "Deams Come True," the float represented a dream that all tribes and nations would come to know Christ the Lord! Christ has called his church to make disciples of all nations and that by God's grace, there is salvation for all who believe.